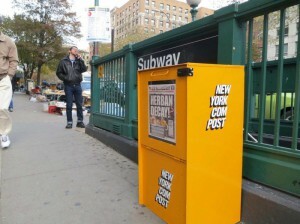 NYC’s commercial composting laws are in place and being enforced. Never fear, we’ll help you stay up to date and in compliance! The most recent official notice regarding commercial organics rules was released on January 19, 2016. Link to the official notice here. The rules were put into effect on July 19, 2016 and were made enforceable by law on January 19, 2017. These rules are outlined below for your convenience. 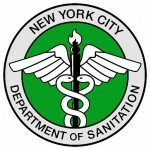 What types of businesses are required by NYC law to separate their organic waste? For these businesses, what types of organics must be separated? 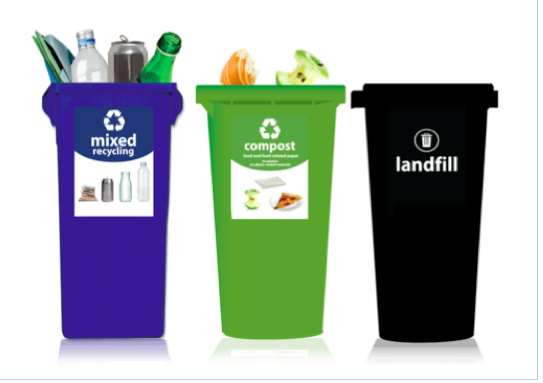 Use labeled containers designated specifically for organics and post signage with clear instructions about separation requirements in areas where customers or staff are disposing of waste. These steps will help reduce cross-contamination among the various waste streams – a major problem in the recycling industry. On that note, always be sure that organics are placed in the appropriate containers and are not mixed with garbage or recyclables. The most common solution is to hire a private carter and be sure to comply with that carter’s specifications, (especially for items like Certified Compostable Products). A far less common option is to register with the NYC Business Integrity Commission to legally self-transport your organic waste. Application for Self Hauler Registration. The final, and most intensive option, is to process your organic waste on-site using aerobic or anaerobic practices, usually with a machine or technology installed on premises (a food waste grinder is not permitted). IF you go this route, be sure to register HERE within 30 days of installation and maintain records for a minimum of three years. We can help if you are interested in exploring options for onsite processing. It is important to note that some processing technologies cannot accept all organic matter (like large bones, and very fibrous materials like artichokes and pineapple tops). For any organic waste that can’t be processed on site, businesses must either haul away or self haul the material to be in compliance with the law. Performing a waste audit is a great way to identify unnecessary waste and find ways to save money! Call the CGC team to help, or you can do it yourself using the EPA’s website to guide your process. Donating food is an excellent way to both give back to your community and reduce your hauling costs. 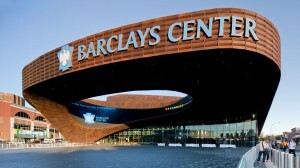 Visit donateNYC for more info on where to donate. 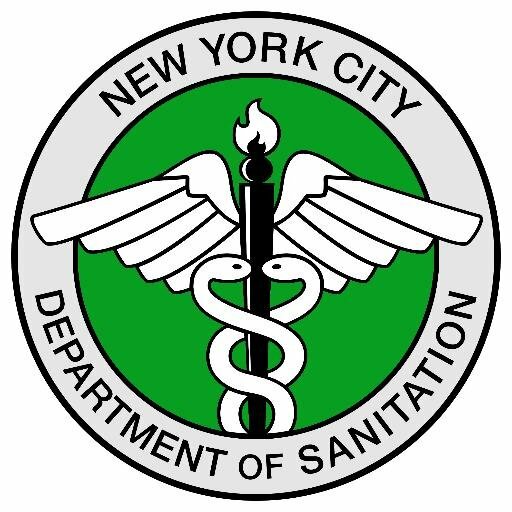 If you suspect that your carter or building management is not handling organics properly, file a complaint with the DSNY. Whether you work in a shared office space with a foosball table, a fancy corporate headquarters with a skyline view, a hot new restaurant, a late-night music venue, or a boutique cafe prizing latte art, you and your coworkers produce a variety of “waste”. Dealing with that waste is complicated, no doubt about it, and while environmentally responsible waste management isn’t always the easiest thing, it doesn’t have to be too difficult either. So whether you own a business, or work somewhere that could use a second look at its waste management policies, we’ve outlined some information below to help ease you into an environmentally sustainable operation. For more information on the regulations, we’ve written a POST for you! Reduced Odors and Pests: Placing food scraps in sealed, leak-proof buckets and/or toters instead of black trash bags makes it hard for vermin and insects to get in and for odors to get out. If you work in an office with a kitchen, you can store food scraps in the refrigerator or freezer, or even start fermenting your food scraps with a pre-composting process using bokashi (more on that soon). Odors be gone! Employee Engagement: Green practices increase employee satisfaction and productivity. Naturally, people enjoy feeling that the work they do has a positive impact. By creating an eco-conscious environment, a business is more likely to extract higher quality work and attain greater commitment by their employees. Composting is a great place to start. Sustainability is Appreciated: In our current climate, awareness is everything and caring about the earth is cool. Consumers notice eco-friendly efforts and want to support businesses that integrate sustainability into their bottom line. If two different cafes offered the same exact coffee, but one served in compostable cups, and the other in survive-the-apocalypse-foam cups, which would you choose for your morning joe? Exactly. Cost Savings: Organics are one of the heaviest components of waste. A post-composting analysis of your waste bill will likely show cost savings that result from diverting heavy food scraps from landfills. 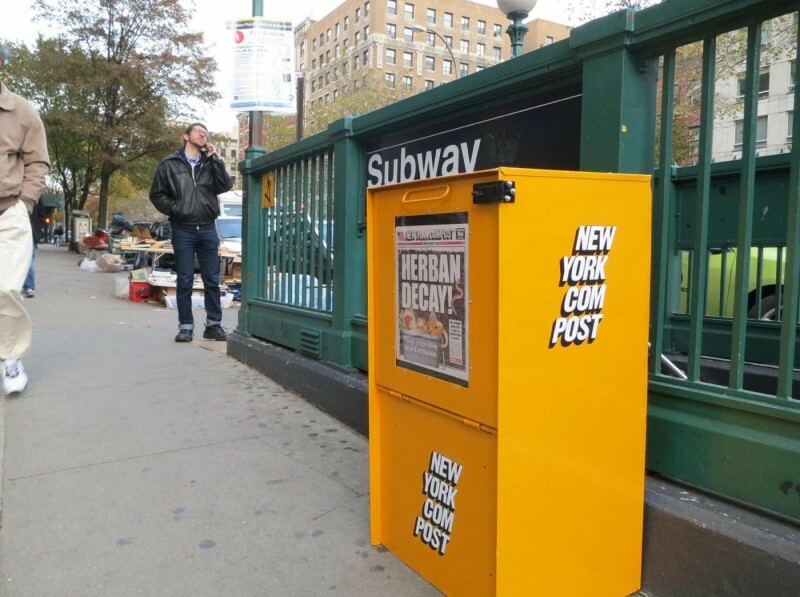 This is not a guarantee, but the commercial composting landscape in and around NYC is rapidly evolving, and changes that incentivise composting in the future are increasingly likely. Healthier Planet: Throwing organic materials into the garbage is harmful to the environment. Organic material decomposing in landfills releases methane, a gas 20 times more effective at trapping heat in the atmosphere than carbon dioxide. By separating organic waste, your business will help to reduce greenhouse gas emissions and simultaneously aid in the creation of nutrient-rich fertilizers and/or renewable energy. FIRST: How are you going to dispose of your organic waste? a good idea to get multiple quotes to find the best price. HERE is a list of vendors as of 2015 to get you started. We recommend asking about the programs a potential hauler provides and confirming they work with your type of business. b.) Hire a micro-hauler (for organic waste only). The following organizations work in NYC and, for a small fee, will pick up your organics and process them locally. with the DSNY within 30 days of installing on-site processing equipment – check out our post on commercial compost regulations, or contact us to discuss! SECOND: Depending on who will be processing your organic waste, make sure you know the rules for what can and cannot be composted. This can vary greatly depending on whether your hauler uses an aerobic or anaerobic process, or whether they are a massive facility or a local organization. This is especially true when it comes to dairy and meat products. We can help by contacting your hauling company and/or speaking directly to the compost facility. THIRD: Educate your employees or fellow co-workers. Find out who on staff is particularly excited to be composting and see if they are interested in managing the process. Make sure your new waste management system is clear enough for a baby to understand. Color coded bins and signs can be really helpful here. We love signage. FOURTH: Shout it out, loud and proud! Let all customers and visitors know how to dispose of their waste effectively. Make it known that you’re a business that cares about the environment. Post it on your website! Put a sign in the window. No one will chide you for gloating about your waste stream mastery, quite the contrary. What with all the other responsibilities you have at your job… call us! That’s why we’re here. We’ll come to your place of business (our first site visit is complimentary), and we can perform a waste audit. Next, we’ll contact your existing haulers to make sure you’re getting the best deal on all of your waste streams. If you’re not, we’ll help you get the best bang for your buck. During that initial site visit, we will walk through your business to understand your current layout, and can work with you to determine a seamless waste strategy, educate your employees, set up the necessary infrastructure, and be available to you for any hiccups or questions that arise while you’re adapting. We even provide high fives, free of charge! 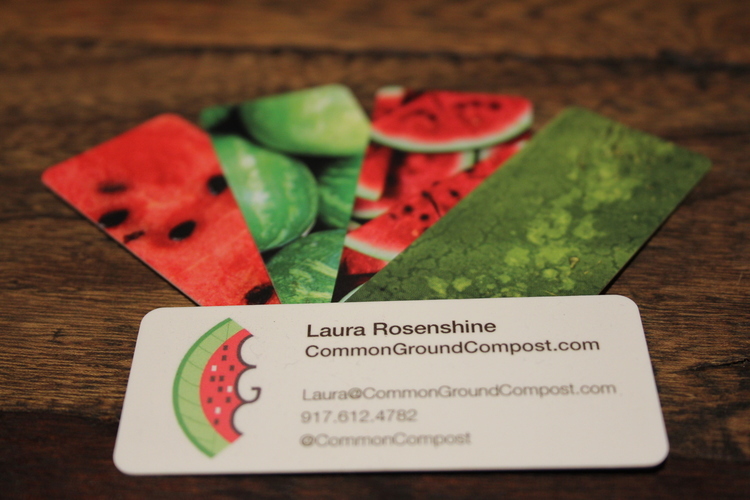 We love high-fives almost as much as we love composting.